This post contains affiliate links, meaning I receive a portion of any sales clicked-through these links. Thanks for supporting Made to Mother! When I think back upon my holiday memories as a child, I remember that I loved traditions the most…Christmas Eve service as a family, with the unshakable anticipation of opening gifts after we got home in the back of my mind the entire time. Warm drinks, cozy treats and pjs while we unwrapped gifts as a family of five in our living room; the heat of our wood stove and the radiant tree lights in the backdrop for years of memories. Us kids could barely sleep that night as we waited with baited expectation for the festivities to come the next day…early morning stockings from Santa, delicious, sugary breakfast treats we rarely got any other day like cinnamon rolls, pancakes or waffles! Then, it was off to my aunt’s house for our annual Christmas party with my mom’s family, playing a gift exchange game and eating lunch. My brothers and I dragged all our new gifts and stocking snacks with us to keep us busy and as evening approached, we headed to our next destination, the best yet; grandma’s house on my father’s side. It would be dark by the time we got there and we would be the last to arrive. My uncle, aunt and our only other cousins, all adults, would be waiting for us with eggnog, a deliciously huge holiday dinner, Christmas records blasting music, and festively-wrapped packages trailing out from under the tree and down the hall. It would be late into the night when we finally piled into our family car, stuffed with food and the trunk packed with gifts and leftovers. We always fell asleep on the drive home, sugar plums and toys dancing in our heads and our hearts full of love, family and fun. One of our favorite ways to do this is by choosing a daily devotion advent activity to do as a family through the month of December. There are some fantastic apps, books and hands-on kits out there to choose from that are more educational and spiritual than the silly little chocolate punch-holes that you find at the dollar store. Last year, we used Truth in the Tinsel, a crafty way to talk about Christ’s birth and the Bible throughout the whole month of December. And with it, we also got to add a whole new bunch of ornaments to our collection! We liked it so much, in fact, that I modified it to use each week of advent in our small church’s Sunday school. And now they offer a church curriculum version, too. This year, we are doing More Than Candy, which I love because it gives us 25 days of activities to do for others, serving in our community and showing the love of Christmas in real, tangible ways, outside of our home during the holiday season. Another tradition I like to make sure we keep is reading the Christmas story on Christmas Eve and Christmas morning. However, with children ages 7, 5 and 2 in our home, it’s not always gripping for them when we read it straight from our NIV Bible. So we like to find other creative and fun ways to hear and tell the story over and over again each year. Sometimes we read it from a children’s bible, or listen to an animated re-telling of it on an audio CD, but my favorite way is letting the kids have full creative control in sharing it. The older ones that have heard the story time and time again can often do a great rendition and almost always get all the key facts in the right order. It is also really fun to let them recreate it by putting on a play! Nothing is cheerier than watching three children play out multiple characters and ad-lib the funniest made-up lines. Sometimes there are two Marys because sisters don’t want to take turns and we have even seen vigilante angels storm the castle of Herod in defense of baby Jesus! Of course, the adults often get in on it by the end to play an odd shepherd or a forgotten wise man, too. Finally, as we buy the food for our holiday menu and wrap our many gifts, I like to remind our children that there are so many others out there that are not as fortunate as we are. We think of ways as a family that we can help those in need and perhaps make the season a little brighter for a few others. Some of the ideas we have come up with include visiting a soup kitchen or holiday pantry and donating food and our time to pass it out. Our kids have their own “Boxing Day,” where we choose at least as many toys or items that we got as gifts and donate them to a charitable second hand store or give to others. Lastly, and one of the most impactful has been participating in Giving Trees or Adopt-A-Family, of which this year, we have chosen to participate in the 3B’s. What are some of your favorite Christmas traditions? How do you make sure your family keeps the right spirit this time of year? Absolutely! Good for you for starting when your son is very young. It will be a joy for you to watch him grow up experiencing the traditions you make happen! I did not have many Christmas traditions growing up. Something we did do was receive new pajamas every year. This tradition I’ve carried over to my own children. They receive them on Christmas Eve every year, and then we curl up and watch The Nativity to set our hearts on Jesus for Christmas morning. Thank you for sharing at The Weekend Brew! I love the PJ idea! I think we might have to add that one to our little family… Thanks for visiting M2M today! Hi, Wynter! I love this post. It is rich with ideas for us, food for thought, and inspiration. I think the advent ideas sounds great, though my kids are probably too old at this point. They now recognize are traditions and count on them. Blessing to you and The Evans Family! I know, right? I dread the day when my babies groan at me in their teenage or young adult voices, “not that, again, mom!” Thanks for stopping by, Hally! I love Christmas traditions and have found that now that my sons are grown they still find them comforting and important. As girlfriends enter the picture some traditions change but their hearts still yearn for familiar and I love this. Growing up Christmas Eve was a night to remember and the family time that we shared was the best memory of all. So glad you joined us at The Weekend Brew. Thanks for reading! I would love to hear some traditions for older kids, if you have any ideas! Thanks for stopping my M2M today and for the suggested link up! I’ll add this post tonight! My hubby and I have been creating new family traditions, since most of the season it’s just the two of us. My hubby loves going to the tree farm and cutting our own tree each year. We also love going on day/weekend trips to visit new places that we’ve never been to. When our adult son comes home, who usually is only able to visit 1 or 2 days at Christmas, we have a meal with all the aunts, uncles, and cousins. We also go to a movie with him or drive around our area to see all the Christmas lights. This year, I want to try celebrating with the “Jesse Tree” (created and shared by Ann Voskamp). Thanks for sharing! That’s awesome! Traditions are still important, even for empty-nesters! I love Ann Voskamp’s Unwrapping the Greatest Gift and hope to use that with our family next year. Thanks for visiting M2M today! Love this post! In fact, just today, I posted 7 Tips for Keeping Christ in Christmas, some of which included setting up a Nativity, doing Ann’s Jesse Tree, participating in the Advent Conspiracy and Operation Christmas Child among others. Thanks so much for sharing your traditions with us, Wynter. That’s awesome! Thank you for stopping by and blessing to you and yours this season! We had a beautiful book “This is the Star” and read it always on Christmas Eve. (I may dig it out and read it again this year even though the kids are all grown up now – I still love it!) It’s illustrations are amazing and the Christmas story is told in a beautiful rhythmic poem that is just right for calming everyone down before bed when they are super excited. Last year was Little J’s first Christmas and we did some fun things that he won’t remember. Now that he is a bit bigger, we are starting some bigger traditions. I made an advent calendar and I am trying to put some fun activities in there, with both a spiritual focus and then some that are more fun. 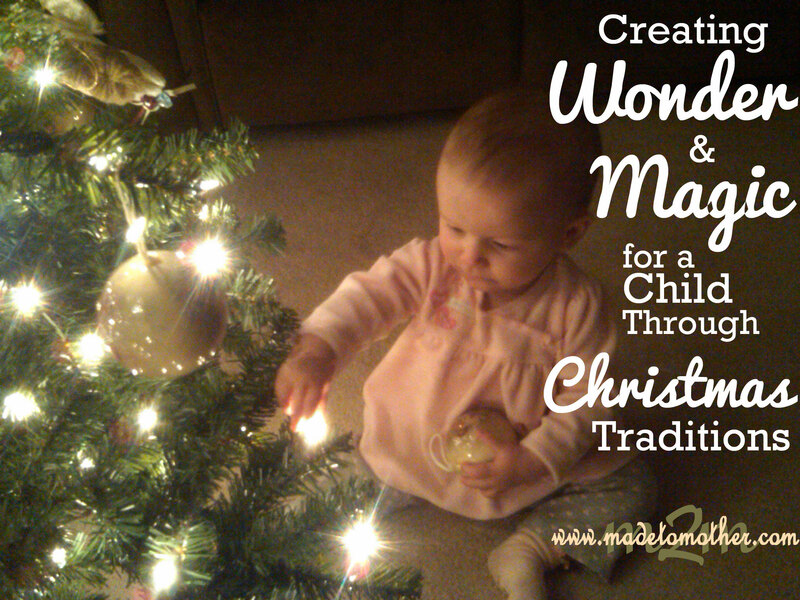 I love holiday traditions, and I want my kids to, too! How sweet, good for you! Little J will love growing up with those traditions! Thank you for stopping by M2M and have a blessed holiday! Traditions are SO powerful. My boys are young, 5, 4, and 2 and this is great food for thought as I consider the things I want to instil in our kids. Glad to be linking up with you from Jennifer’s! Those are great ages to start! Blessings and thank you for dropping by M2M today! I love hearing others’ Christmas traditions and you’ve shared some lovely ones here. This month I have my daughter doing an advent chain. Each link represents something that Christmas is (a time for giving, a time for charity, a time for memories, etc). Then we read an applicable scripture. It’s been such a blessing. Thanks for sharing and for linking up to the #SHINEbloghop! I love that take on the Advent chain! What a great idea! Thanks for stopping my M2M and sharing your tradition. Thanks for visiting today and for your kind words! Blessings to you and yours this Advent season. One of my favorite Christmas traditions is our little Christmas program at our country church. Ours is this coming Sunday, and we are so looking forward to it. Love it! I remember when my childhood church used to do that. Wish more churches would do them! Honestly, we aren’t doing a lot, traditions-wise. Right now, it would overload an already full plate to add on extra “should”s…. But I love reading about other peoples’ traditions and getting ideas though! Very wise, good for you for knowing to limit what will cause more stress in your family life. Thanks for reading and have a blessed season! Great post! It’s so fun to read about everyone’s Christmas traditions. Thank you for sharing yours. I love reading others traditions and comparing to those I recall and the new ones we have for our kids. Thanks so much for linking up to the Country Fair Blog Party this month!